So, How ARE the 2 Weight Loss Authors Doing? We’re doing it! So as not to take up a lot of space (and your time), I am only posting my stats and Steve’s, although I will periodically report on the progress of all four of us. For those of you who may be interested, we are all keeping track of our daily meal plans on MyFoodDiary.com. Here is a sample from a couple different days. As you can see, we have two different approaches. Steve counts calories and I count carbs. By the way, Iris and Gary are moving down the scale too! Steve is still working on getting his book on Amazon. In the meantime, if you want to join us and count carbs, go to the Carb Light Living™ Program Link and build your own program in 2 easy steps. 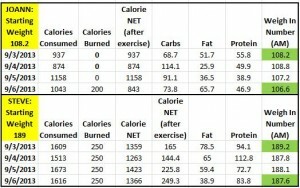 Find your ideal daily calorie intake total for weight loss. 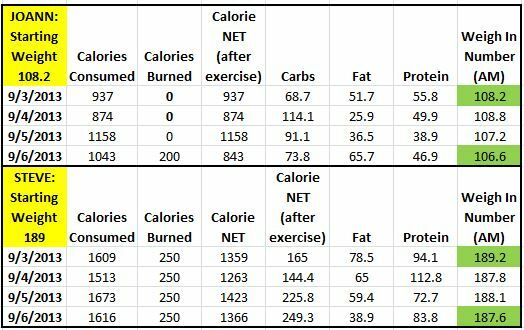 Find your desired CARB LEVEL intake using the Carb Light Living™ Carb Chart, which is based on your calorie target, as determined in Step 1. You have 3 options to choose from – or 3 rates of weight loss with each calorie total. (see above program link for more details).